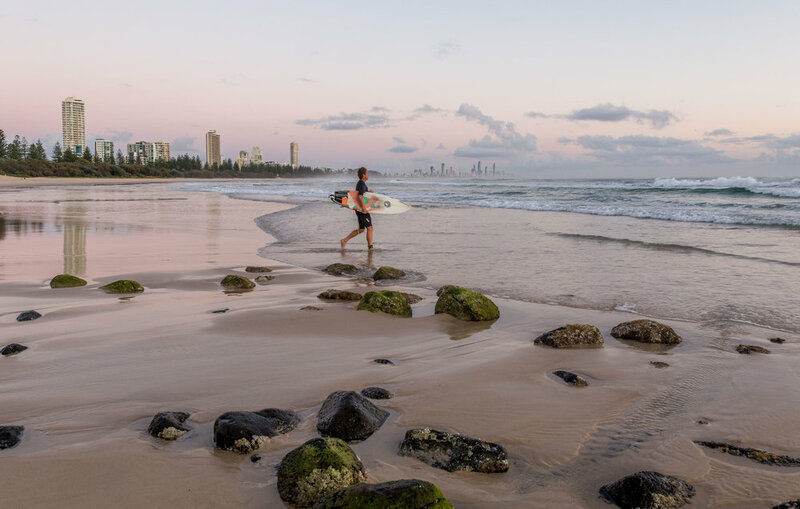 The Gold Coast.......famous around the world for its magnificent beaches, stunning glassy surf breaks, theme parks, nightlife, Schoolies Week, shopping, hinterland walks.....the list is endless. Since I'm an outdoorsy type of girl, I spend a lot of time in the water, on walking tracks, and sipping coffee near the beach and people-watching. 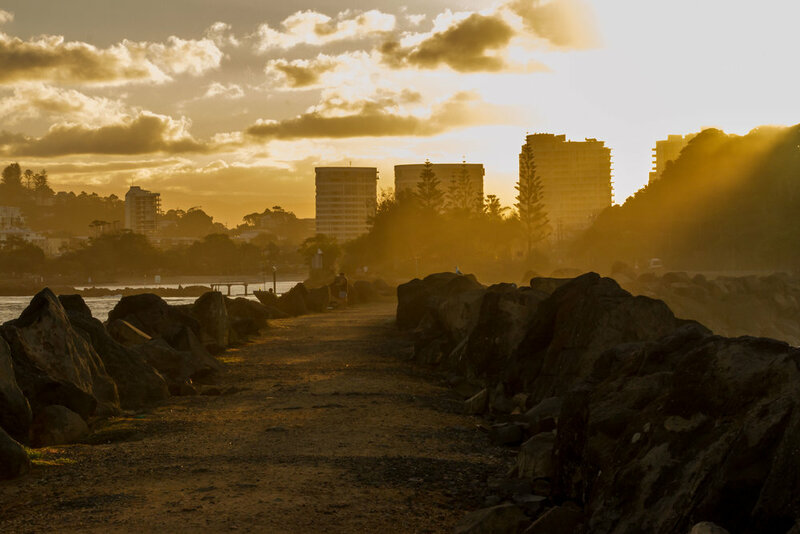 The Burleigh Head National Park is one that I have visited many times. It is 27.6 hectares of pristine eucalypt forest and pandanus groves with several walking tracks (a high one and a low one). Oh, the shady forest is so welcome on a hot Queensland summer day, and the views? Amazing coastal scenery, birds, and frothy white surf with an stunning turquoise ocean. Did I mention people-watching? Fitness buffs. Families. Photographers. Holiday-makers. Locals. Surfers. Picnickers. Weddings. Last time I was there, a body builder was getting oiled up for a photo shoot down on the rocks! (okay, I confess I may have stayed around there a little longer than necessary). One time I met a lovely...shall we say...'silver surfer' named Ron (fictitious name to protect anonymity) down at Burleigh Beach, very early on a Friday morning. He looked like he was waiting for someone, his battered surfboard tucked under one arm, his fluoro boardies lighting up the scene. Ron said although he loved to surf, he never liked to be the FIRST one in the water, so he was waiting for other surfers to arrive and take the plunge first. I admired his attitude, and mind you, his age! 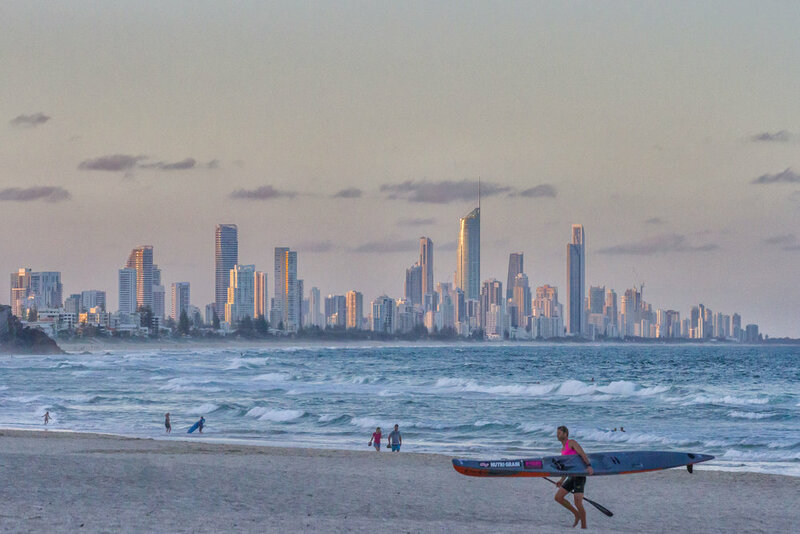 He was a born-and-bred local, and had nothing but good things to say about the Gold Coast. To him, the casual outdoors lifestyle offered him freedom in his working and family years, but continued to offer that freedom with wide open beaches and a huge surfing community in his later years. On ya Ron! As soon as the sun came up over the horizon, I wandered over the surf club and ordered a hot steaming flat white and a paper. I sat at a surfboard-shaped table overlooking the beach, and enjoyed a relaxing start to my day.